Ivy Knitalong: I started yesterday! 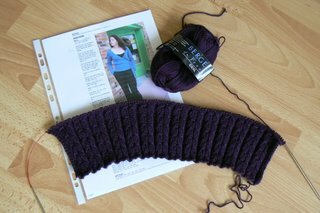 It is so difficult to take a good pic with such a dark color... you can try to put some more light on your screen if you want to see the Twisted Rib Pattern...This is what I did during the week-end and I'm really happy with the result! It seems that the size is OK (that's always such a problem for me!...) and it's a pleasure to knit with that yarn (Ideal by Bergere de France, 50% wool). I look forward to seeing yours when it's finished!